The Soyuz MS-09 spacecraft is pictured moments after docking to the space station’s Rassvet module. The Soyuz MS-09 spacecraft docked to the Rassvet module of the International Space Station at 9:01 a.m. EDT while both spacecraft were flying over eastern China. 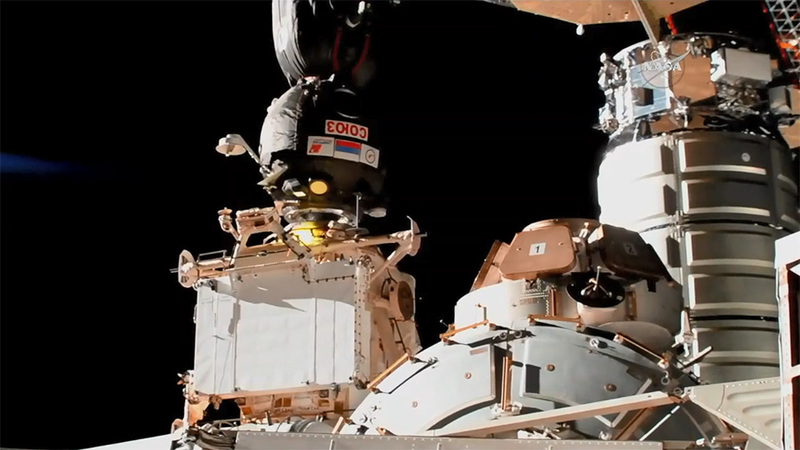 Following their two-day trip, astronaut Serena Auñón-Chancellor of NASA, astronaut Alexander Gerst of ESA (European Space Agency), and cosmonaut Sergey Prokopyev of Roscosmos docked to the space station. Their arrival restores the station’s crew complement to six as they wait to join Expedition 56 Commander Drew Feustel and Flight Engineers Ricky Arnold of NASA and Oleg Artemyev of Roscosmos aboard the orbiting laboratory. The hatches between the two spacecraft will open following standard pressurization and leak checks. Watch the hatch opening and welcome ceremony on NASA Television and the agency’s website beginning at 10:30 a.m.
For more information about the mission, visit: https://blogs.nasa.gov/spacestation/. Get breaking news, images and features from the station on Instagram at: @iss and on Twitter @Space_Station and @ISS_Research.